Once worry strikes, it can be incredibly difficult to stop. I don’t have to tell you this because you’ve experienced it. One small thought of care entered your mind and before long, your brain transformed into full-blown anxious mode. In the Soul Secure Bible reading plan and journal, I emphasize that in order to win over worry, we must catch ourselves choosing that first worried thought before it escalates into a tornado. Prayer is an incredible strategy to combat worry! Last week in our Bible reading challenge Facebook group, I shared 7 ways to pray against worry. 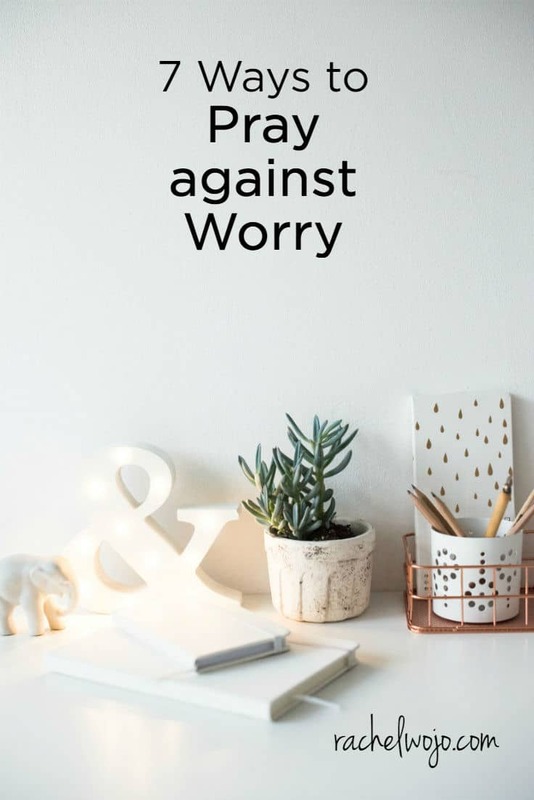 Many readers commented about how helpful these prayer points are and I think you’ll find them to be a personal gift of 7 ways to pray against worry. 1. Surrender thoughts of worry to God in prayer. 2. Pray for help to recognize God’s presence is with you. God is always with us; the Bible teaches he is omnipresent. While we know this truth, consistently remembering it can be difficult. Whenever worried thoughts first enter our minds, we can ask God to help us realize he is always with us. His presence calms our hearts when we turn our attention to him. 3. Ask the Lord to help you recall his truths to replace your worries. Filling your heart with the truth of God’s Word provides an arsenal against fretting. To pray against worry, ask God for the ability to remember the promises of the Bible. Once you’ve recalled a Bible verse or phrase to fight against uncertainty, pray for the truth to saturate your mind and replace your apprehension with his confidence. 4. Pray for God’s peace to rule your heart. God has not given us a spirit of fear, as the Apostle Paul explained to Timothy. God rules in power and love and gives us a SOUND mind, not one filled with distress and uneasiness. When we request the peace of God to rule our hearts, then God will answer that request. Worry will dissipate in the name of Jesus. 5. Ask for forgiveness in your worry and pray for the ability to trust God more. Confessing that worry is sin also provides the opportunity to ask the Lord to forgive us. Just as Peter looked down at the waves as he walked out to Jesus on the sea, he cried out, “I believe; help my unbelief.” When doubts arise, the Master of the Sea longs for our trust. 6. Pray for protection against worry. The previous points outlined how to practically pray against worry, but praying for protection against worry before it begins is critical. When we are most aware of our weaknesses and ask for help, God’s strength shines. The Holy Spirit will guard our minds and hearts against worry in answer to this prayer. We don’t have to worry about being worried! 7. Give thanks to God for being in control. Many times worry arises because we feel like circumstances are spinning out of control. “When things seems out of control, God is always in control.”– One More Step Lifting up thanks to God for his supreme authority is a prayer praise that carries incomprehensible power. Thanksgiving is one sure way to annihilate worry! If worrying is a match you’d love to win over, then these 7 ways to pray against worry are sure to help! Which one will you choose to implement right away? If you enjoyed this article, you’ll love the Soul Secure Bible reading plan and journal! This journal focuses on 31 days of daily tools that will both encourage and motivate you to become more disciplined in your spiritual growth. Win over worry through God’s Word and the Soul Secure: Winning over Worry Bible reading plan and journal! I want to grow my faith with God. Its seems like I’m not getting any answers from God no matter what I pray and ask, I try with all my heart to walk by faith, and it seems that the more I try more problems arise. I feel I can’t get across to God, I know I he hears me and sometimes I feel him, but I need to learn to walk on more faith. Need a journal or just learn to read the bible and understand it. Join our Bible reading facebook group, Nancy! There are all kinds of folks just like you and we help each other along the faith journey. This month’s focus is trusting God. Let me know if you need help to get connected in there. I am struggling so much with worry and anxiety at this moment with decisions that need to be made about our future. Your site and writings ALWAYS provide guidance for me.